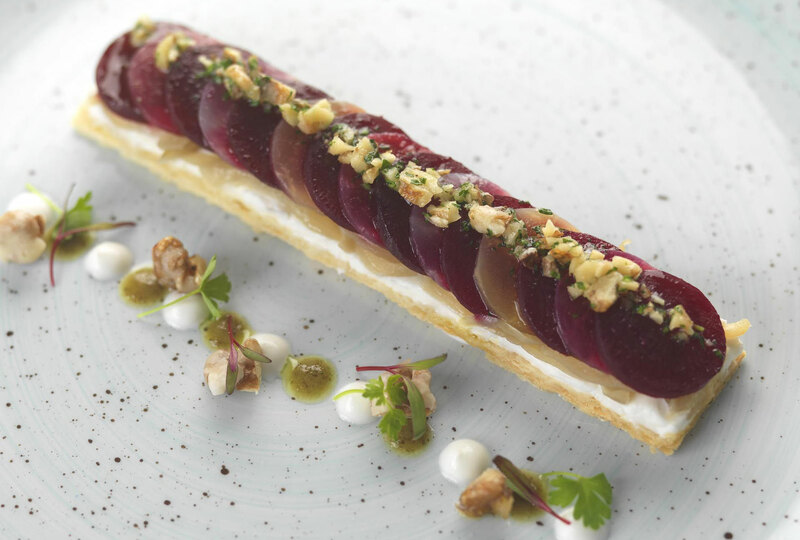 The sweetness of the beetroots in this dish complements the creamy tanginess of the goat’s cheese perfectly. The addition of a walnut based dressing and frosted walnuts adds a delightful earthy crunch. Preheat the oven to 180˚C. Roll out the pastry to 0.5 cm thickness in a rectangular shape. Transfer onto a baking sheet lined with parchment paper and prick pastry with a fork at regular intervals. Place another sheet of parchment paper directly on top of the pastry and top with a second baking sheet to keep the pastry flat. Add a weight on top of the second baking sheet to stop the pastry rising. Bake for about 20 minutes, until golden brown and crisp to the touch. Allow to cool with weight on top. Wash, dry and rub each beetroot with olive oil, salt and pepper, reserving about 20 ml olive oil for the onions. Wrap each beetroot individually in aluminium foil and bake until soft, about 45 minutes depending on size. Allow to cool then peel. Finely slice onions and sweat in the remaining olive oil in a pan covered with a lid. Remove the lid when the onions are soft, about 10 minutes. Season with salt and continue to cook without colour until dry. Remove from the pan and cool. Heat goat’s milk in a pan until warmed through but not boiling. Remove from heat and crumble goat’s cheese into warm milk. Blend until smooth, season and cool. Toast walnuts in a dry frying pan until they lightly colour and become aromatic, about 3 minutes. Remove from heat and cool. Roughly chop half the walnuts and set aside. Blend the remaining walnuts with parsley, vinegar and olive oil until a thick dressing consistency is achieved. Season and set aside. Bring water and sugar to a boil, then using a thermometer bring the syrup up to 115˚C. Remove from heat and immediately add the walnuts, stirring to coat in syrup. Turn walnuts out onto a tray lined with parchment paper ensuring the walnuts are separated from each other. Season with sea salt and cool. Slice puff pastry into rectangles a similar width to the diameter of the beetroots. Thinly slice beetroot into round disks. Using the back of a spoon, spread a thin layer of the goat’s cheese directly onto the pastry, reserving a small amount for decoration. Cover with a thin layer of onions then top with overlapping disks of beetroot. Warm tart in oven for 5 minutes. Serve with a line of walnut dressing down centre of the tart topped some roughly chopped walnuts. Arrange dots of walnut dressing and dots of goat’s cheese next to the tart, finish with frosted walnuts and micro herbs.